It wasn’t seven days in to our inaugural Making Learning Connected MOOC (#clmooc) that I found myself nearly overwhelmed by the number of great ideas and resources that I had already gained access to by participating in the collaborative MOOC. Wanting to get a grip on my learning, and even more importantly, wanting to give credit to the projects, makes, and resources that had motivated that learning, I decided to go back through the posts and tweets from that week and find at least five that I could engage in a post of my own. And in this way, Find Five Friday was born. We all learn throughout the day, in the contexts distinctly designed for learning and in our informal spaces, too. We also learn with and from many people–young and old, those designated as teachers or mentors and those we don’t even know. For me, Find Five Fridays have become a way for me to realize the learning that is made through connections with others. For these reasons, I continue to #F5F outside of the CLMOOC, and can see it could be offered as an activity for learners in many contexts as a way to make learning pathways visible. Borrowing from the Twitter trend of posting the handles of people who you think others should follow on Twitter along with the hashtag #FF, Find Five Friday or #F5F is simply a make, blog post, or a series of five interactions that further connection with others in your learning network who are inspiring your makes, helpful in providing resources, or otherwise pushing your thinking. 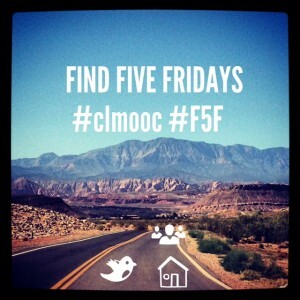 Find Five Fridays have also continued into the second year of #clmooc. The prompts can be found here, and people’s posts in G+ can be found here, and on Twitter here.